Dam good write up Agent007, as always! 19. The hilux in theory with the more powerful brake calipers, wider tyres and lower tread wear tyres ought to have a traction advantage over the NP300 which results in shorter stopping distances. 15. The higher UTQG rating on the NP300 Toyo Open Country A25 255/60/18 tyres would mean that it should last longer than the OEM supply from Toyota. 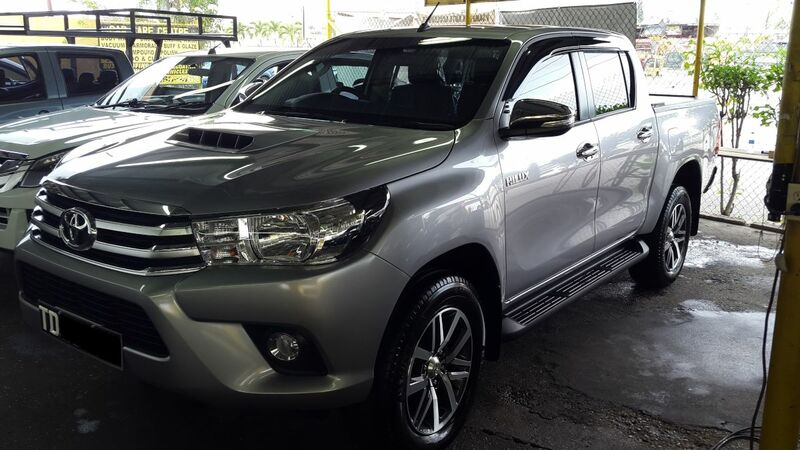 In international markets, both the Hilux and D23 NP300 have a lot more features that is not simply available to us in T&T. For example, the Hilux in some markets does have rear AC vents as can be seen in the grey market imported Hilux Revo / Rocco units. As for the NP300? In some international markets, there are knee, side and curtain airbags as well as a powered sunroof, powered rear sliding glass, standard rear parking sensors, 6/7" touch screen stereo, forward collision warning, front headlamp washers, a center head rest for the backseat, a 2.3L twin turbo diesel engine with same HP and torque figures but it is said to be more fuel efficient than the YD25DDTi which emit less harmful emissions and make less noise. What I noticed between the two is that the Hilux feels more 'trucky' in its operation and much more solid/heavy on the road. It feels really planted whereas the NP300 is more nimble as it is lighter and thanks to the rear coil springs, it also rides easier in terms of less impact harshness making its way into the cabin. Nissan says that the rear 5-link/coil spring setup saves a couple of pounds in weight as it is apparently lighter than a rear leaf spring setup. 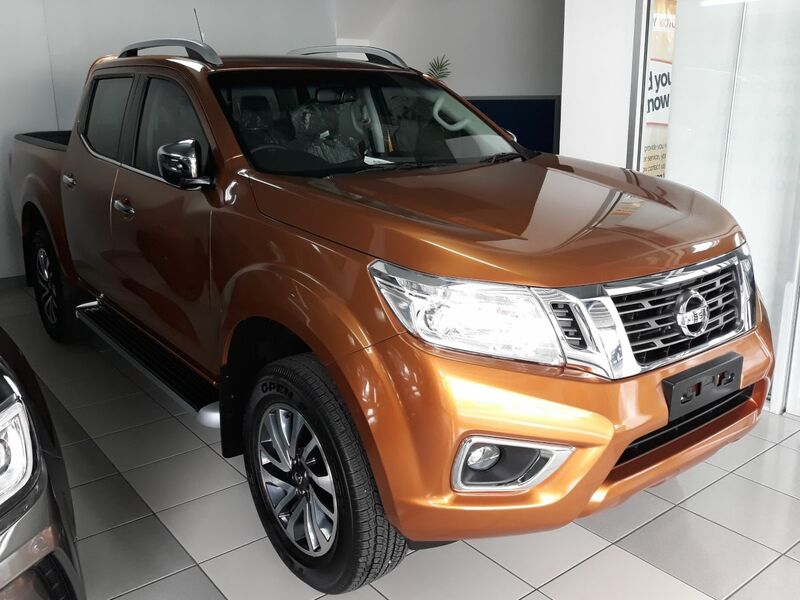 This means the NP300 Frontier LE from Massy Motors is marginally lighter than the NP300 Navara from the grey market importers. The NP300 is also faster for obvious reasons over the Hilux and the seating position in relation to the positioning of the dashboard and front windshield feels more crossover-like than a 'trucky' pickup. In other words after sitting in a NP300 and then to go drive a Hilux or D-Max, you may associate the NP300 to be closer to a crossover. As owners of both, thus far we're leaning more on the NP300 as the winner here. There is one thing I don't like about TTTL though and that is their policy when it comes to servicing the vehicle. The oil change is at the conventional 5,000kms interval which is normal but the oil filter is changed every 10,000kms. At Massy Motors, at every 5,000kms interval, both the oil and oil filter is changed. 1. The only versions that has the 18" rims are the SRV's, all other versions apart from the commercial grade ones ride on 17" rims. 2. The only Hilux from the factory that comes with an OEM installed rear view camera is the SRV Leather with the 7" touch screen DVD stereo. You cannot play DVD's if the van is in motion ie. transmission on D.
1. The only versions that has the 18" rims is the LE Fabric 18" and LE Leather 18". There is an LE Leather 16" explained below. 2. The LE Leather 16" alloy rims can also be found in all XE models. 3. All XE and LE models come with a factory installed OEM rear view camera passing though a 5" non touch TFT LCD screen. 4. All XE and LE models share the same auto dimming rear view mirror with digital compass. 5. The only models to feature the projector xenon HID lamps with LED DRL's is the LE line-up. 6. The LE line-up has a 16" Leather and an 18" leather. 7. There is also an 18" fabric LE but no 16" fabric LE. 8. All XE and LE have the steering controls for audio, bluetooth, drive menu and cruise control. 9. Only the LE leather has the heated seats and I think driver's side power seat. 10. All XE and LE have rear AC vents. 11. All LE's have dual-zone climate control. 12. LE's have proximity key with push button start. 13. LE's have the traction control/stability control enable/disable button. 18. only the LE has the 188hp; 450Nm torque version of the YD25DDTi. All other versions like the S, SE and XE share the lower power output version of 161hp and 403Nm torque). 19. All S and SE versions are 6MT only. All LE versions are 7AT only. Some XE models are both 6MT and 7AT. 20. NP300 Navara VL's from the grey market dealers come with a double DIN 7" touch screen Kenwood supplied headunit vs as mentioned previously, the 5" non touch in the local NP300 Frontier XE and LE. If there are any inaccuracies in this post, please feel free to highlight same and I'll make the adjustments. I hope this post was helpful to would-be buyers. Cheers fellow tuners! Really appreciate the time and effort spent comparing these two popular vehicles. Even as an owner of the 2011 Hilux 3.0 I will definitely review the NP300 sold from Massey for next pickup during 2019.
also how does the mileage compare ? my 7 year old hilux gets me between 710km-730km per fill up. What about the isuzu? They were known to be serious workhorses back in the day, despite the signature loud engine..
rebound wrote: What about the isuzu? They were known to be serious workhorses back in the day, despite the signature loud engine.. They are just above basic overall I find. Better looking of the set, drl really bring em out and not spaceship looking. Have a slightly modern interior, comfy ride. 4x4 a lil unsteady in front the competition. Engine not noisy as they were. IHI turbos, I think team loco said thats the only truck turbo they never had to rebuild yet. Do well on our sh1t fuel and are very affordable brand new. I actually wanted to buy one but when I run the numbers, buying a new truck is a loss all round to you. I opted for a used one. What ya'll think bout this? De Dragon wrote: Looks never factored into my decision when I bought a pickup years ago. I wanted a reliable, proven beast to haul sheit and drive on T&T's "bess" roads. So spaceship type anything was out of the question, so too were those space robbing Super Up type tray covers and roll over bars. 2.5 Manual Hilux Basic model. Sure right about space ships. All the new ones ugly except the ranger. The bt50 maybe has the most fyahz. L200 last in the list cuz it ride rough, ugly etc. Hilux overpriced and overrated. Second best looking though. nick639v2 wrote: What bt 50 you have boss? Have men treating their van like chit then blaming it for not lasting too. To each their own i guess but i don't see myself ever sinking that set of money for a new hilux. amd-dude wrote: Over the years, my 2cents: Note that these were driven hard not just on the road/road test i.e. in the forest helping pulling out trucks and timberjacks from mud. I drove Mazda's, Toyota's, Isuzu, Jeep, Nissan, Dodge. 1, The absolute king of durability is the...........................................................Mazda BT-50, have a TCF series and the only problem this thing gave was a turbo seal needed changing, possible cause was helping a stuck timberjack and revving the balls off of it. 2. For comfort, Hilux and Nissan. 4. For going places that only heavy machinery could go, Jeep Wrangler, nothing else I drove comes close, no not even them hilux with snorkel and big tires, leave that at home and don't mamaguy yourself. The new Rangers are pretty decent as well but they haven't seen any hard work yet so I can't comment but the 2.2 engines are nice for the size and go really far on one tank. Ranger 2.2 makes a very loud noise after a few months . yea boi i heard a ranger 2.2 idling n it was louder than my old bt50..
Actually one of the very first Mahindra's was a rental here where I work. Looks like d 2.3L twin turbo model. In my experience, an SUV is way more useful than a fully loaded pickup since they dont come with the tray rack to carry long items......If I have to carry long items now I actually use the SUV instead of the pickup....Its boils down to preference I guess..
rebound wrote: In my experience, an SUV is way more useful than a fully loaded pickup since they dont come with the tray rack to carry long items......If I have to carry long items now I actually use the SUV instead of the pickup....Its boils down to preference I guess.. This...last year for flood relief my former crv (2015) carried 1.5 times as many cases of water than a hilux loading up both his tray and back seat! (My backseat was down as well). Mind you there will obviously be things a pickup are better suited for carrying, but the extra size and loss of ride comfort, interior quality, features etc just aint worth it for me personally. why you keep saying that the engine loud, the engine isn't as loud as before i find it very quiet , the hilux on the other hand , got two coworkers with the new hilux but with previous 3l engine and that when it starts up is loud compared to my isuzu engine. There is a huge concern for many would-be van purchasers about the lack of the protective bar behind the cab itself to facilitate carrying long objects etc. Nissan calls this the “headache” rack. These racks for the NP300 are standard on the S and SE lines but absent on the XE and LE lineup. You can buy this rack as an accessory item and it is bolted to the tray via 6 mounting points. Have it painted to match the colour of your van before installing. The approx. total cost for this item (including painting and installation) is $2k. You can also get a fabricator to customize one for you because even though the XE and LE’s don’t come with this particular rack, as I mentioned before, the 6 mounting points are there. Given climate/weather/terrain circumstances of today, having a 4wd double cab pickup is a must have. Research before you attempt to buy other vans apart of the Nissan if such a rack can be installed. I know as a fact that Nissan designed their tray to accommodate it as an after purchase install. I noticed the 2.4 auto Hilux comes with that bar standard as well which is a huge plus who see this feature as a must have the way we did. Our Hilux got 500 or so kms per tank in its best day. I know if driven more gently it may crack into the 600 range but I never personally saw that. The NP300 we have only has 400kms on the odo as I type and the tank is still above half. I would say it appears the np300 will be able to achieve the 600kms range easily. For those who prefer the chrome roll bar to the back which comes with a third stop light in it, prepare to spend $4,000. We got free genuine Weathertech branded all-weather rubber floor mats with the van and as you may know, these mats aren’t the regular generic $199. mats you find at any parts place. If someone has the prices on the rear tow hitch, roof rack cross bars and the front nudge bar, I would be grateful if you can share the same and indicate where it can be procured. I hope the info was useful and do note, these prices are from the top of my head so I won’t be surprised if someone points out more accurate pricing. Last edited by agent007 on October 19th, 2018, 1:29 pm, edited 3 times in total. agent007 wrote: There is a huge concern for many would-be van purchasers about the lack of the protective bar behind the cab itself to facilitate carrying long objects etc. Nissan calls this the “headache” rack. These racks for the NP300 are standard on the S and SE lines but absent on the XE and LE lineup. You can buy this rack as an accessory item and it is bolted to the tray via 6 mounting points. Have it painted to match the colour of your van before installing. The approx. total cost for this item (including painting and installation) is $2k. Those ranges knda low, I make get over 800km to a tank of diesel from my dmax and that with driving within the speed limit and not idling for long periods of time . Also my commute is north to south everyday or north to south east once or twice a week. Strange enough I know two of XE 4x4 that came with headache rack. Well one paid extra for a headache rack and the other was told, yes the van does come with the rack. I doh like it doh, cause how it extends above the 3rd brake light, unlike the Hilux Vigo models that run inline with the cab height (cause no 3rd brake light).